(CHECK SPECIFIC VEHICLE APPLICATIONS AND EXCLUSIONS). FOR USE WHEN REPLACING BOTH FACTORY AMPLIFIED OR NON-AMPLIFIED RADIO WITH AN AFTERMARKET DOUBLE-DIN RADIO. THIS ITEM IS 100% BRAND NEW! 95-7605 + 70-7551 + 40-NI10. AFTERMARKET RADIO INSTALLATION KIT WITH. HARNESS AND ANTENNA ADAPTER COMBINATION PACKAGE. NEW (FACTORY SEALED PACKAGING). PAINTED SILVER TO MATCH FACTORY COLOR AND FINISH. Recently Some Radio Manufacturers started making Double Din Radios with 7 Inch Screens (some slightly smaller). These Double Din Radios are about (7″ W x 4″ H) 7 inches wide by 4 inches tall. Unfortunately this new size “DOES NOT” work with Metra Installation Kits without some modifications. Some of these kits have been manufactured for many years before this new size radio became available. As far as we know, none of the Aftermarket Kit Manufacturers are using this new size opening at this time. The Standard Radio Opening for this kit is approximately (6 7/8 in x 3 7/8 in) or (173mm x 98mm). If you have one of these larger radios, you will need to “SAND” or “FILE” the opening of the TRIM RING or BEZEL to make it large enough to clear the “FACE” of your radio. Unfortunately at this time there are no other alternatives that we know of. AN EXPLANATION OF DIFFERENT TYPES OF RADIOS AND COMPATIBILITY. ” NOT COMPATIBLE ” WHEN INSTALLING A FACTORY OEM RADIO OR ATTEMPTING A FACTORY RADIO SWAP. ” COMPATIBLE ” WHEN INSTALLING AN AFTERMARKET DOUBLE DIN RADIO. A DOUBLE DIN RADIO IS ABOUT 7 X 4 INCHES IN SIZE. ” COMPATIBLE ” WHEN INSTALLING (2) STACKED ISO-DIN RADIOS TOGETHER. SEE ISO-DIN DESCRIPTION BELOW, BOTH UNITS SHOULD MATCH DESCRIPTION BELOW. ” NOT COMPATIBLE ” WHEN MOUNTING AN AFTERMARKET DIN SIZE RADIO ” WITH ” THE USE OF A RADIO SLEEVE OR CAN (USUALLY PROVIDED WITH YOUR RADIO). A SINGLE DIN RADIO IS ABOUT 7 X 2 INCHES IN SIZE AND HAS A METAL SLEEVE AROUND THE FIRST 3 INCHES OF THE RADIO. WHEN MOUNTING AN AFTERMARKET DIN SIZE RADIO ” WITHOUT ” THE USE OF A RADIO SLEEVE OR CAN, UNIT IS SCREW MOUNTED, MUST HAVE MOUNTING HOLES ON SIDE OF CHASSIS. UNIT IS A SINGLE DIN RADIO ABOUT 7 X 2 INCHES IN SIZE. If you are not sure if your radio will work with this kit. Please use the “ASK A QUESTION”. Link on the bottom of the page. Please include your Radio Brand and Model Number for faster service. METRA TURBO2 95-7605 AFTERMARKET RADIO INSTALLATION DASH KIT. Painted Silver to Match Factory Color and Finish. Replaces the Entire Climate Control Panel. Retains Full Functionality of the Factory HVAC System. Heavy Duty ABS Plastic Construction. METRA 70-7551 AMP INTEGRATION WIRE HARNESS. Plugs Into Car Harness at Radio. Power and 4 Composite Inputs. RCA Connectors for Factory Amp Retention. METRA 40-NI10 ANTENNA ADAPTER. Nissan Factory Diversity Antenna Plug to Aftermarket Radio Antenna Adapter. Before you replace your factory radio with your New Aftermarket Radio, make sure you get the same parts a Professional Installer would use. Whether you’re installing an Alpine, Blaupunkt, Clarion, Dual, Jensen, JVC, Kenwood, Panasonic, Pioneer, Sony, Soundstream, Valor or another stereo, you’ll want to get the right parts with the BEST Fit and Finish. Don’t be fooled by cheap or generic brands, only use Genuine Metra Products. This Aftermarket Radio Install Kit comes with good instructions on removing the Factory Radio as well as installing your New Aftermarket Radio. This listing INCLUDES a Complete Set with Amp Integration Wiring Harness and Antenna Adapte r. Do you have Steering Wheel Controls like Volume, Track and Seek Buttons? Are these used on a daily basis? Maybe during a morning or evening commute? If so, the ASWC-1 Steering Wheel Control Interface might be the perfect addition. It works with most major brands like Alpine, Clarion, Kenwood, Pioneer, Sony and more. Please see the ASWC-1 LISTING. For complete list of brands and details. If you have any questions, kindly use the “ASK A QUESTION”. (1) METRA 95-7605 Radio Housing. (1) Climate Control Cable. (1) METRA 70-7551 Nissan Amp Integration Wire Harness. (1) METRA 40-NI10 Nissan Antenna Adapter. METRA 70-7551 NISSAN AMP INTEGRATION WIRE HARNESS. METRA 40-NI10 NISSAN ANTENNA ADAPTER. This ITEM ships “FREE” in the U. Protectorates and APO/FPO Addresses. Must have a valid U. We are a U. Although these parts work with many vehicles outside the U. To research whether the part they are ordering will MATCH , FIT , WORK or is COMPATIBLE with their vehicle before purchasing. We suggest you check the online forums for your particular vehicle, normally you will find someone who has already posted on this topic and provided the needed information. We apologize, we cannot join every forum to do this. First Class Package International (Trackable). 8-15 Days (about 3 Weeks). First Class Package International. 8-28 Days (about 4 Weeks). 6-10 Days (about 2 Weeks). 6-15 Days (about 3 Weeks). MAKE OFFER Sometimes you might see a lower price or a sale price. It doesn’t mean your offer will be accepted, but it is a way of having your offer considered. Kindly press the button to make an offer for consideration. If we do not have this button posted on this listing, it means this feature is not available for use at this time. We do our very best to correctly represent all items we sell. Unfortunately, sometimes there may be incidents beyond our control. We realize this can be very frustrating and upsetting, but if you give us a chance, you might be pleasantly surprised to find that there can be solutions to just about any problem. By using the “ASK A QUESTION”. We normally will respond to you within 24 hours or within the next day. You can even call our Customer Service Line at 657.464.0713. Please leave us a message, and we will get back to you as soon as possible. Please describe the problem as throughly as possible, pictures are always helpful, so we can see what you are seeing. We reserve the right to determine whether the part(s) will need to be exchanged or another course of action may be taken to resolve this matter quickly and efficiently. We provide our services as a courtesy for all International Buyers ANYONE OUTSIDE THE U. 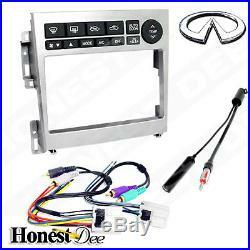 The item “95-7605 Double-Din Radio Install Dash Kit with Wires for G35, Car Stereo Mount” is in sale since Wednesday, November 09, 2011. This item is in the category “eBay Motors\Parts & Accessories\Car & Truck Parts\Other Parts”. The seller is “honestdee” and is located in Los Angeles, CA. This item can be shipped to United States, Canada, United Kingdom, Denmark, Romania, Slovakia, Bulgaria, Czech republic, Finland, Hungary, Latvia, Lithuania, Malta, Estonia, Australia, Greece, Portugal, Cyprus, Slovenia, Japan, Sweden, South Korea, Indonesia, Taiwan, South africa, Thailand, Belgium, France, Hong Kong, Ireland, Netherlands, Poland, Spain, Italy, Austria, Israel, Mexico, New Zealand, Philippines, Singapore, Switzerland, Norway, Saudi arabia, Ukraine, United arab emirates, Qatar, Kuwait, Bahrain, Croatia, Malaysia, Brazil, Chile, Colombia, Costa rica, Panama, Trinidad and tobago, Guatemala, Honduras, Jamaica, Dominican republic, El salvador. INTERNATIONAL BUYERS: PRODUCTS SOLD ARE FOR VEHICLES IN THE U.S.A. ONLY! Tagged: 95-7605, dash, double-din, install, mount, radio, stereo, wires.